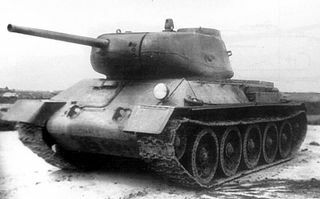 The T-43 is a Soviet tier 7 medium tank. 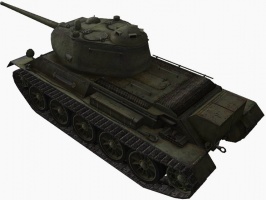 Designed to replace the T-34, and actually historically predating the T-34-85, the T-43 features increased hull armor and a new torsion bar suspension replacing the T-34's Christie suspension, but retains the same weapons as the T-34-85 and has similar turret protection. 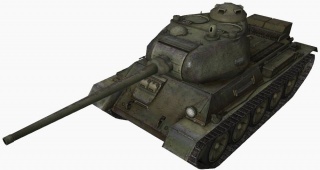 As a Tier 7 medium tank, the T-43 is expected to face Tier 9 tanks using the same gun that the T-34-85 had at Tier 6, which can be frustrating at times, to say the least. The T-43 leads to the T-44. Good depression and elevation angles, especially for a Soviet tank. Good turret armor, combined with decent gun depression. Good side and rear armor. Surprisingly good at side-scraping. Above average resistance values and mediocre P/W ratio mean rather sluggish mobility. Average at best gun handling. Exposed fuel tanks can easily catch fire from a penetrating hit to the front. 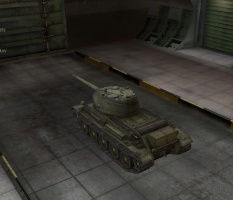 Mounts the same exact 85mm gun the T-34-85 gets, and cannot mount it immediately at stock. 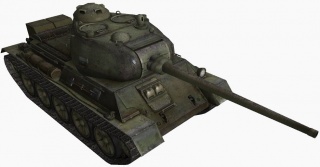 The T-43 plays the same as the T-34-85, and is generally considered the mid runner of the Tier 7 medium tanks, much like how the T-34-85 was also the mid runner among the Tier 6 medium tanks. It generally does not have any particularly outstanding features, but will perform most roles competently, if not remarkably. Mobility-wise, the T-43 is fairly decent, but unremarkable. Being heavier than the T-34-85 while using the same engine, it has a lower power-to-weight ratio, and hence accelerates more sluggishly. Having said that, the top speed is fairly decent, and it will have no problems relocating to other flanks as needed. Maneuverability is, though not outstanding, good enough for a medium that is primarily a flanker. The T-43 does have better hull armor than the T-34-85, but must now face Tier 8 and 9 tanks on a regular basis, so it is not actually that much of an improvement. It is useful against lower tier tanks, and angling will yield some lucky ricochets, but the armor should generally not be relied upon to protect it beyond its well sloped turret. The module layout, combined with the generally more powerful guns that the T-43 faces regularly, means that even if it can survive the hits, it risks being crippled with modules or crew members knocked out. With all this in mind, the T-43 generally performs best as a second-line support tank or flanking medium. It simply does not have the penetration and accuracy of the Pz.Kpfw. V Panther to perform as a sniper, nor does it have the armor or agility to engage in close combat with enemy tanks without taking heavy damage and/or crippled modules. Picking your targets wisely should be a primary goal. As the tanks great DPM, great alpha (for a DPM oriented cannon), strong turret armor and sloped armor can give weaker tanks a tough time. Exploiting weaker enemies will also allow your team to take on tougher targets. An alternate choice to the D5T is the 122mm U-11. Equipped with this cannon the T-43 can be played very aggressively in support of heavy tanks or in the company of other mediums. The U-11 is able to damage most opponents reliably, albeit lightly, even from the front. In addition the U-11 allows for consistent module damaging and crew killing shots that can significantly hamper higher tier vehicles. However, there are two downsides to this play-style: 1) The sluggish acceleration makes it tough to get away after firing, unlike the T-34-85, which can effectively employ hit-and-run tactics. 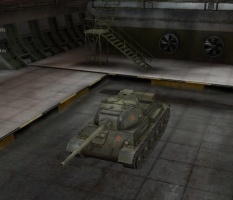 2) The damage potential against heavily armoured opponents is simply too low to be useful in tier 8 or 9 matches. One-shot kills become nearly impossible and with the 122mm the T43 lacks the DPM to take the enemy down quickly with multiple shots. This enables the T-43 to engage opponents successfully at close range using circling tactics while keeping the enemy tracked. So crippled, these enemies can then be picked apart by the T-43 and any allies with a shot at the enemy vehicle. 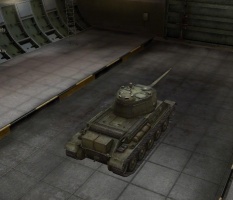 Due to the fact that the T-43 takes a lot of module damage, going ll Camouflage as the first skills is helpful to reduce the chances of being detected and getting hit in the first place. As with most medium tanks, going all Repair for the first skills is also viable. A more specialized set of first skills would be Situational Awareness (Commander), Snap Shot (Gunner), and Smooth Ride (Driver). The loader only has perks available, which are not useful until they have reached 100%, Repair or Camouflage are viable options for the loader, which may later be swapped out for his perks. The combination of Snap Shot and Smooth Ride act like a Vertical Stabilizer (which the T-43 does not have access to), reducing the accuracy penalties while moving in a straight line or turning the turret, and by extension, allowing the T-43 to get an accurate shot off faster after stopping. Situational Awareness increase the tank's decent 360 m view range further. Mentor may also be used instead of Situational Awareness if the emphasis is on getting the other crew members' skills up faster. Smooth Ride may be substituted with Off-Road Driving for improved overall mobility. Clutch Braking also a viable option for the driver. Upon reaching 100% on the first skills, dropping the commander's skill for Sixth Sense is highly advised, as it is one of the most important perks in the game, especially for a medium tank. The loader's skill is highly advised to be dropped in favor of Safe Stowage, due to the T-43's highly vulnerable ammunition racks. Brothers-in-Arms is a good perk to have on any tank, but requires all crew members to have it at 100% before it works. The bonus to crew skills is particularly noticeable when combined with Improved Ventilation. It improves nearly every aspect of the tank's performance, but is generally better saved for later in favor of more important skills and perks like Repair, Safe Stowage, and Sixth Sense. 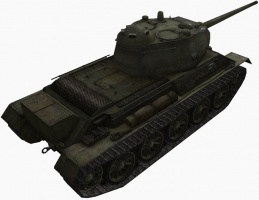 Most of the modules will have been unlocked on the T-34-85, including the top gun (the D5T-85BM) and engine (the V-54K), but mounting the gun requires second turret, which in turn requires the upgraded suspension, so the top priority is to unlock the T-43M suspension. The suspension also has better terrain passability which makes you accelerate much faster. Next, research the T-43 mod. 1943 turret in order to mount the D5T-85BM. It may be a good idea to use the enhanced suspension equipment first, thus allowing the top turret and gun to be mounted sooner. Note: It is possible to skip the engine upgrades in favor of simply moving on to the T-44, although this is not advised. 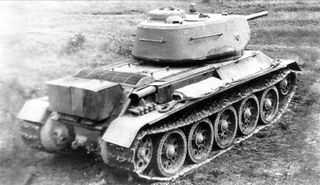 The T-43 had a configuration like the T-34 Medium Tank; its glacis consisted of 75 mm of armor and its turret-front was 90 mm. The tank was armed with the 76.2 mm F-34 Tank Gun. However, the total length of the engine and transmission compartment was not reduced; therefore, the battle compartment remained very cramped. To increase internal space, Soviet designers applied a torsion bar suspension that was more compact then the original Christie «candle» suspension. It was the first time that a torsion bar suspension was used for medium tanks. None of the guns currently available were ever used by the T-43. Two of its historical armaments, the 76 mm F-34 and 85 mm D-5T (no relation to the D5T-85BM), are missing. 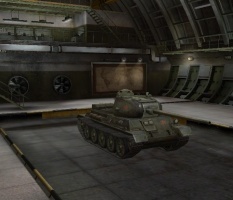 These guns are used by the T-34 and KV-85 respectively. The F-34 was the T-43's original armament, while the D-5T was fitted during development. This page was last modified on 31 October 2018, at 14:06. This page has been accessed 436,659 times.